Description: Broadside view of CP 2101 a NRE 3GS21B-DE Genset locomotive, on the engine siding on the west end of Peterborough, Ontario. Description: Rear 3/4 right side view of CP 2101 a NRE 3GS21B-DE Genset locomotive, on the engine siding on the west end of Peterborough, Ontario. Description: Rear 3/4 view of CP 2101 a NRE 3GS21B-DE Genset locomotive, on the engine siding on the west end of Peterborough, Ontario. Description: Front right 3/4 view of CP 2101 a NRE 3GS21B-DE Genset locomotive, on the engine siding on the west end of Peterborough, Ontario. Description: Left rear 3/4 view of CP 2101 a NRE 3GS21B-DE Genset locomotive, on the engine siding on the west end of Peterborough, Ontario. 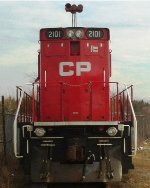 Description: Rear view of CP 2101 a NRE 3GS21B-DE Genset locomotive, on the engine siding on the west end of Peterborough, Ontario. 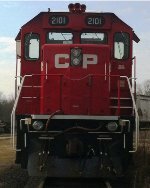 Description: Front view of CP 2101 a NRE 3GS21B-DE Genset locomotive, on the engine siding on the west end of Peterborough, Ontario.